Need a great recipe to take to the SUPER BOWL party? Love buffalo wings? If you do, you’ll love these! Wings have been ANY sports favorite for as long as I can remember. 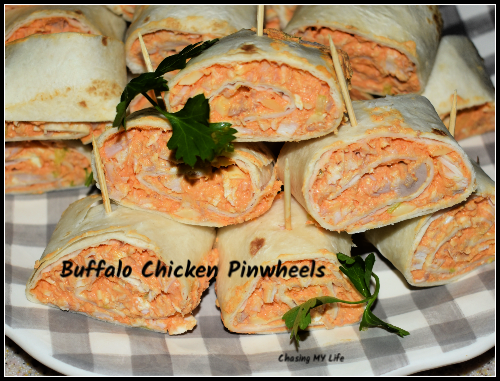 I’ve made pounds and pounds of chicken wings and even made Buffalo Chicken Dip many a time, but was ecstatic when I ran across a recipe for the same flavors in a wrap cut into pinwheels by Brandie over at HOME COOKING MEMORIES. This is the perfect and delicious party food with all the flavors of buffalo wings plus the blue cheese, but without sticky fingers. Personally, I don’t care for Bleu cheese so I substitute Gorgonzola. I also use rotisserie chicken which adds a a little extra flavor and I decreased the hot size just slightly. In a bowl, beat cream cheese on low. Add in hot sauce, Gorgonzola and Colby-Jack cheeses. Add green onions, mixing until blended. Fold in shredded chicken into mixture by hand. Spread approximately 3/4 cup of mixture on top of one of the tortillas. Roll up tortilla TIGHTLY. Place rolled tortillas on a plate and cover with plastic wrap. Refrigerate for 2-4 hours. Remove from refrigerator and unwrap. Slice each rolled tortillas in half and then each half into 3 slices, discarding ends. Place pinwheel slices on serving plate or tray. IF using different sized tortillas, adjust amount of buffalo chicken mixture you add to each tortilla.